Considerable knowledge of the people, however, has come from studying the Etruscan necropoli in Italy. The sites from the seventh century (the 600s BC are rich, indeed; the burial sites may contain chariots, ivory, bronze, amber and gold ornaments. We have also found sanctuaries and temples with images of Greek gods. All of that plus written accounts about the Etruscans by Greek and Roman writers has provided a picture of a culture based on extended family units with internal hierarchies based on age with particular deference to the eldest couple, the patriarch and matriarch. [*The Gaudo culture was a neolithic culture primarily in the region of Campania, active at the beginning of the 3rd millennium BC. The culture is so named for the archaeological type site, Gaudo, a necropolis near Paestum at the mouth of the Sele river. The Gaudo culture is called an eneolithic culture due to its use of copper tools. The necropolis occupies about 2000 sq. meters and contains 34 separate tombs. It was discovered late in the year 1943, during the Allied invasion on the Salerno plain, when the construction of the Gaudo airfield unearthed some of the tombs. A British officer and archeologist, Lieutenant John G. S. Brinson, conducted a scientific excavation of the tombs, and recorded his findings in a notebook now held in the National Archeological Museum of Naples. Gaudo relics are at the archaeological museums of both Paestum and Naples. The archaeological record since then is an overlay of various cultures of the first millennium BC from the Etruscans to the Romans. Some of the episodes of "cross-cultural" contact were anything but peaceful: invading Samnites (the great enemies of the Romans) took the city in the fifth century, and the Romans eventually razed it in the third and built their own "Picentia" on the ruins of Amina. The Etruscans were at a high point in Pontecagnano around the year 600 BC and shortly thereafter, at which time the town co-existed with the cities of Magna Grecia such as Poseidonia (Paestum), Velia, Pithecusa (Ischia) and Cuma and was a major crossroad of merchandise, ideas and peoples from all over the Mediterranean: Greeks, Phoenecians, Etruscans and others. The city started to decline around 550 BC. Like other Italic peoples, the Etruscans of Amina chose unwisely in later struggles against Roman hegemony. They sided, for example, with Hannibal in the Second Punic War. So far, archaeologists have found about 9,000 tombs in the area. Many of the artifacts such aspottery, jewely, etc. may be viewed at The National Archaeological Museum of the Agro Picentino (Picentine Plain) and at the Archaeology Park of Pontecagnano. 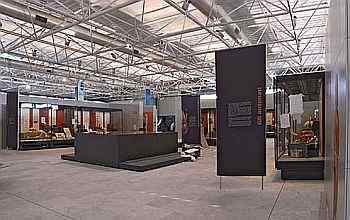 The museum is divided into six sections, running from Prehistoric (3500-2300BC) to the age of the Romans (3rd century BC to 5th century AD). 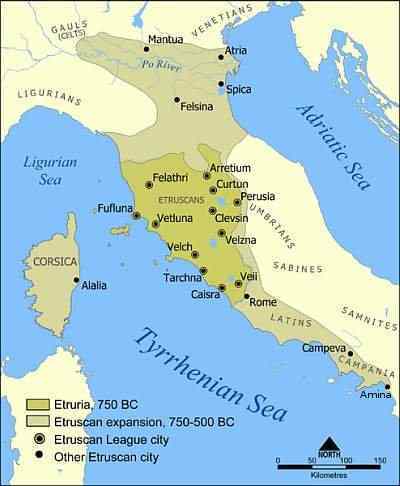 At its height, the town of Picentia, as in Etruria, proper, seems to have been a society in which political and economic power was in the hands of an aristocracy, dominated by powerful princes who lived a luxurious life-style. The museum has a breath-taking display of one the oldest aristocratic tombs yet found in Campania. It is of a princess, accompanied in death by a vast array of jewelry and other symbols of rank. Such tombs reflect a certain social model in which Etruscan women enjoyed greater prestige and power than their Greek or Roman counterparts. The in situ Archaeology Park in Pontecagnano covers 85 hectares/210 acres. Much of the work has thus far concentrated on Roman Pictentia, but the entire area is the object of intense archaeology, and time will reveal much more. —Aurino, Paola and Gianni Bailo Modesti. "Pontecagnano (SA) - Between The City and the Sanctuary: The Excavations along the Motorway's SA/RC Extension" in Newsletter Archeologia (CISA), no. 0 [sic], pp. 6-21, pub. by the Orientale University of Naples, on-line here. —Bonfante, Larissa. "Etruscans" in The Oxford Companion to Archaeology. Oxford U. Press, ed. by Brian M. Fagan, 1996. —Fedei, Maurizio et al. "Integrated geophysical survey to recognize ancient Picentia’s buried walls, in the Archaeological Park of Pontecagnano – Faiano (Southern Italy)" in Annals of Geophysics, vol. 51, N. 5/6, October/December 2008. Published by INGV, the National Institute of Geophysics and Vulcanology, Bologna, Italy. —Martin, Debra L. and David W. Frayer. Troubled times: violence and warfare in the past. —Robinson, Andrew. "The Etruscan Alphabet" in Lost Languages; The Enigma of the World's Undeciphered Scripts. McGraw-Hill, 1957.